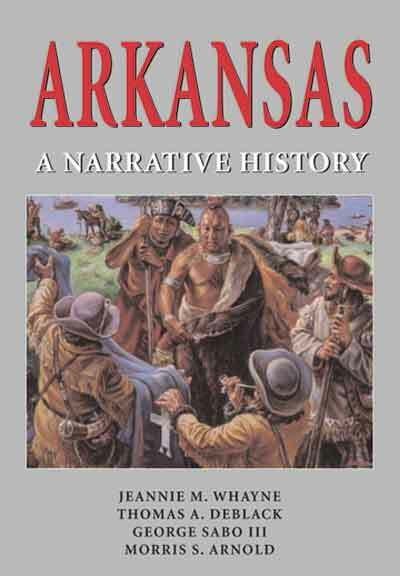 Four scholars track the tensions, negotiations and interactions among the different groups of people who have called Arkansas home. Anthropology professor George Sabo III discusses Native American pre-history and the shocks of climate change and European arrival. Morris S. Arnold, United States Circuit Judge for the Eighth Circuit, examines the accommodations worked out between French and Spanish colonists and native communities and the roles of minority groups and women in developing law, government and religion; producing goods; and market economies. Jeannie Whayne, chair of the history department, shows how these relationships unfolded during American settlement. She discusses how mutuality ended when white settlers transplanted plantation agriculture and slavery to formerly native lands. Arkansas State University history professor Thomas DeBlack shows how plantation society, though prosperous, brought the state into the Civil War. Whayne then discusses different groups’ access to the political process; postwar economic issues; and the interrelated problems of industrialization, education and race relations. The authors then examine how the Civil Rights Acts of the 1960s transformed political and social landscapes, but left behind vestiges of old attitudes and prejudices.